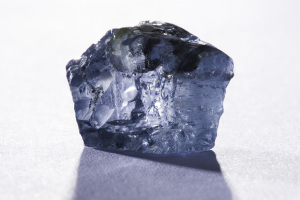 Cullinan is renowned as a source of large, high-quality gem diamonds, including Type II stones, as well as being the world’s most important source of very rare blue diamonds. 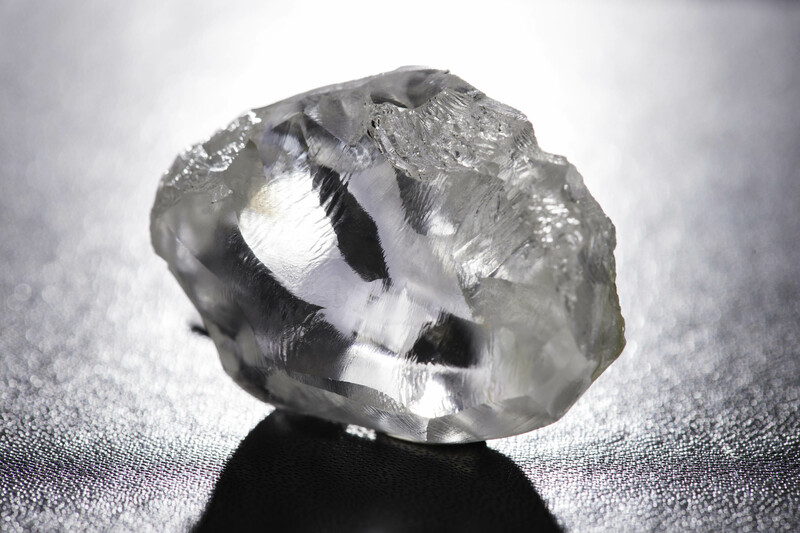 Cullinan earned its place in history with the discovery of the Cullinan diamond in 1905, the largest rough gem diamond ever found at 3,106 carats, which was cut to form the two most important diamonds in the British Crown Jewels. Many of the world’s most famous diamonds herald from Cullinan, and it continues to produce world-class diamonds under Petra’s stewardship. Cullinan contains a world-class gross resource of 190.3 Mcts as at 30 June 2018, which suggests its mine life could be significantly longer than the current mine plan to 2030. The Company’s development plan led to underground ROM throughput increasing from 1.9 Mt in FY 2017 to 3.7 Mt in FY 2018, which delivered 1.3 Mcts ROM and 0.03 Mcts from surface tailings production. Plant optimisation at Cullinan is ongoing, with the recovered ROM grade improving from ca. 33 cpht in H1 FY 2018 to 37.8 cpht for H2 FY 2018, with Q4 FY 2018 yielding a grade of 39.3 cpht. ROM grade is expected to remain in the 38-42 cpht range from FY 2019 onwards. In FY 2019 steady state production of 4.0 Mtpa will be delivered from C-Cut Phase 1 and CC1E. The Company will on an ongoing basis investigate the optimal plan to utilise the full extent of the large Cullinan orebody (ca. 16 hectares at current production depths). .
1. Refer to Petra’s ‘Effective Interest in Mines’ in the following document: Analyst Guidance – Explanatory Notes. The Cullinan kimberlite pipe was discovered in 1902 and open pit mining commenced at the ‘Premier’ mine (as it was then known) in 1903. Ore extraction has been by underground mining methods since 1946. Ore extraction has varied between 2 and 5 Mt per annum and ore treatment between 2 and 7 Mt per annum. The mine was renamed ‘Cullinan’ as part of its centenary celebrations and to link the mine to the illustrious heritage of the Cullinan diamond, which provided the two main polished diamonds within the British Crown Jewels (the 530 carat Great Star of Africa and the 317 carat Lesser Star of Africa). 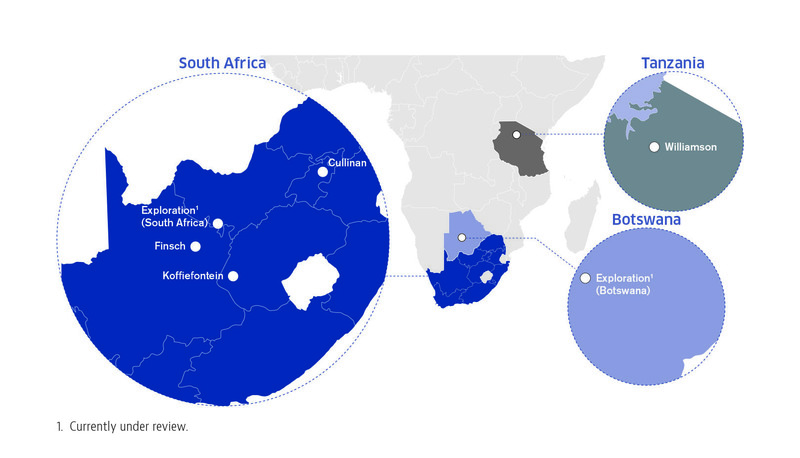 Petra initially acquired a 37% interest in the Cullinan mine from De Beers in 2008, but increased its direct interest in the mine to 74% in late 2009 when it acquired Al Rajhi’s holding in the mine. Petra continues to mine the underground resource using block cave mining methods. Cullinan is renowned as a source of large diamonds and frequently yields diamonds larger than 10 carats. Furthermore, it has produced over 800 stones weighing more than 100 carats, 140 stones weighing more than 200 carats, and around a quarter of all diamonds weighing more than 400 carats. Cullinan is also renowned as the world’s most important source of blue diamonds, providing the collection of 11 rare blues displayed in 2000 at London’s Millennium Dome alongside the Millennium Star and which included the fancy vivid blue ‘Heart of Eternity’ (27 carats polished). A 39.9 carat diamond which sold for US$8.8 million in 2008. A 26.6 carat diamond which yielded a fancy vivid blue and internally flawless 7.0 carat polished stone known as the ‘Star of Josephine’ and sold for US$9.49 million at a Sotheby’s auction in 2009. A 507.5 carat white diamond known as the ‘Cullinan Heritage’ which was sold in 2010 for US$35.3 million. A 25.5 carat blue diamond which sold for US$16.9 million in 2013. A 29.6 carat blue diamond which sold for US$25.6 million in February 2014 and was then cut and polished into the perfect 12 carat ‘Blue Moon’. A 122.52 carat blue diamond which achieved a value of US$27.6 million in 2014. A 232 carat white diamond which was sold for US$15.2 million in September 2014. Read more about our Diamond Heritage. Other notable diamonds historically produced from Cullinan include the Premier Rose (353 carats rough), the Niarchos (426 carats rough), the De Beers Centenary (599 carats rough), the Golden Jubilee (755 carats rough) and the famous Taylor-Burton diamond (69 carats polished). 1. Resource bottom cut-off: 1.0mm. 2. Reserve bottom cut-off: 1.0mm. 3. 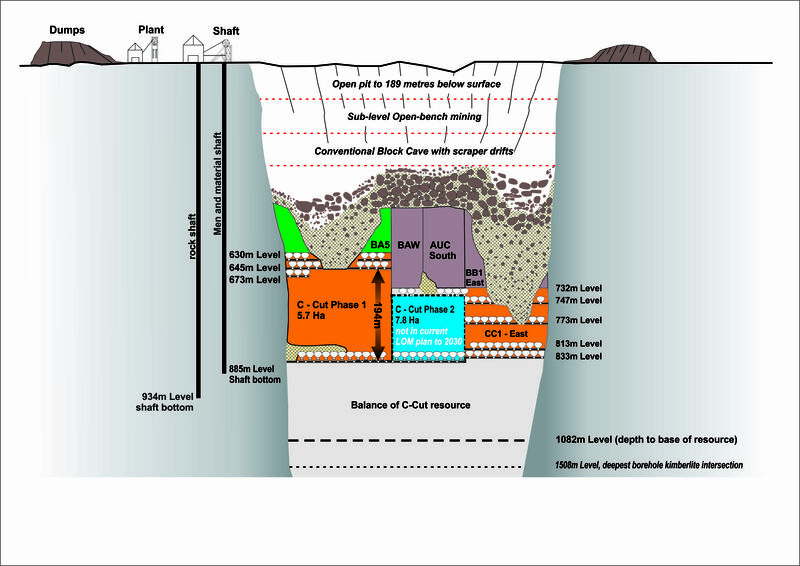 B-Cut resource tonnes and grade are based on block cave depletion modelling and include external waste. 4. 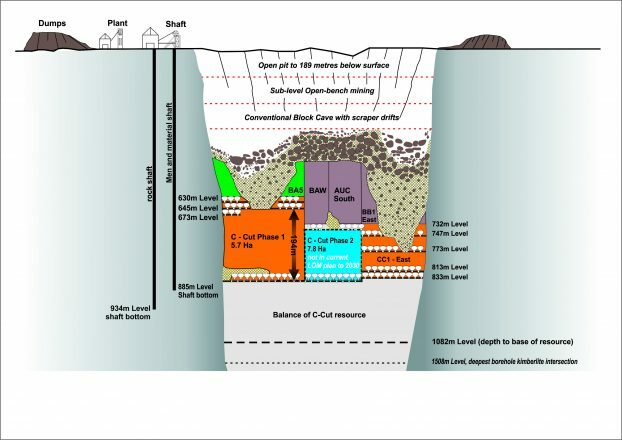 C-Cut Resource stated as in-situ. 5. Reserves based on PCBC simulations on C-Cut phase 1, BB1E, AUC, and Mine2-4D schedules for CC1E and other remaining pillar retreats. 6. Factorised grades and carats are derived from a calculated Plant Recovery Factor (“PRF”) for the new plant. These factors account for the efficiency of sieving (bottom cut-off), diamond liberation and recovery in the ore treatment process. 7. The PRF has been revised since plant commissioning in FY 2018, based on the actual operating parameters and recovered grades of the new plant. 8. A new Resource estimate is currently in progress for Cullinan. 9. US$/ct values of 115-125 for ROM, excluding exceptional stones, and 60-65 for tailings , based on FY 2018 sales values and production size frequency distributions. 1 The Company is not able to precisely measure the ROM / tailings grade split because ore from both sources is processed through the same plant; the Company therefore back-calculates the grade with reference to resource grades. Production increased 74% to 1,368,720 carats in FY 2018 (FY 2017: 786,509 carats) mainly due to a 97% increase in ROM carat production as the new C-Cut Phase 1 block cave continued to ramp up and the new plant operated at planned throughput rates. Production from the undiluted C-Cut mining areas (including CC1E) increased to ca. 2.46 Mt in FY 2018 (FY 2017: ca. 1.2 Mt). Plant optimisation is ongoing, with the recovered ROM grade improving from ca. 33 cpht achieved in H1 FY 2018 to 37.8 cpht for H2 FY 2018, with Q4 FY 2018 yielding a grade of 39.3 cpht, in line with revised guidance of 37 – 42 cpht for H2. A total of 0.4 Mt of tailings were treated with an average grade of 6.5 cpht. The C-Cut Phase 1 project is planned to contribute ca. 3 Mt for FY 2019. A further 0.7 – 1.0 Mt will be sourced predominantly from the CC1E mining area, as well as from other B Block tonnes. Steady state production of 4.0 Mtpa will be delivered from C-Cut Phase 1 and CC1E from FY 2020 onwards. The ROM grade at Cullinan is expected to remain in the 38 – 42 cpht range from FY 2019 onwards. Tailings production is planned at ca. 1.5 – 1.7 Mt yielding 6 – 7 cpht, whilst the plant optimisation (total throughput in relation to mill settings and recirculating load) is ongoing. Longer term steady state tailings production is expected to be ca. 2 Mtpa, yielding 6 – 7 cpht. Cullinan contains a ‘Tier 1’ diamond resource of 190.3 Mcts (including 17.3 Mcts in tailings) and the Company will on an ongoing basis investigate the optimal plan to utilise the full extent of the large Cullinan orebody (ca. 16 ha at current production depths). The Company’s current mine plan has a life to 2030, but the major residual resources at the mine indicate that the actual LOM could extend beyond 2030. Cullinan Diamond Mine (Pty) Ltd (“CDM”) holds a valid new order mining right (the ‘‘Cullinan Mining Right’’) dated 4 December 2007. The Cullinan Mining Right was initially granted to De Beers pursuant to Item 7 of Schedule II of the MPRDA and was ceded to CDM by a notarial deed of cession on 1 July 2008 pursuant to section 11 of the MPRDA and duly notarially executed and registered in the Mineral and Petroleum Titles Registration Office. . The Cullinan Mining Right confers on CDM the exclusive right to mine for diamonds in relation to the areas it refers to until 3 December 2037. Pursuant to the MPRDA, the Cullinan Mining Right is renewable (for periods of up to 30 years for each renewal) on the basis more fully set out in section 24 of the MPRDA. Section 2 of the Royalty Act requires CDM to pay the South African Government a royalty for minerals recovered under the Cullinan Mining Right. Pursuant to section 4 of the Royalty Act, the royalty is to be paid on gross sales in accordance with a defined formula set out in the Royalty Act. The formula applicable to rough diamonds is as follows: 0.5% + (earnings before interest and taxes, as defined in Section 5 of the Royalty Act / (gross sales x 9) x 100) but not exceeding 7%. CDM is also subject to corporate tax in South Africa at the rate of 28% in terms of section 5 and other provisions of the Income Tax Act 58 of 1962. There are no fiscal stabilisation provisions in place in relation to Cullinan Diamond Mine. In September 2017, Petra completed the construction and commissioning of a modern, fit-for-purpose processing plant at Cullinan, with a throughput capacity of 6 Mtpa. This has replaced the previous plant at Cullinan, which was originally commissioned in 1947 and which had undergone numerous refurbishments over the years. Due to its age and operational complexity, it had become expensive to maintain, requiring significant stay-in-business capex, and costly to operate, particularly given the large size of its 26 ha footprint. The plant was also based on old crushing technology, which is known to impact large stone recoveries as while diamond is the hardest substance known to man, it cannot take impact and therefore very large stones can be shattered using conventional processing techniques. At the same time, the energy efficiency of the old plant was not aligned with the Company’s vision. The design of the new plant was therefore planned to address these shortcomings and was considered an important factor in setting out a long-term sustainable future for the mine. The new plant utilises gentler processing methods (comminution via attrition) instead of extensive crushing in the form of autogenous milling and high pressure grinding rolls, which are expected to reduce diamond breakage and improve recoveries across the full spectrum of diamonds, including the larger/exceptional stones for which the mine is rewnowned (the top-cut of 75mm will cater for diamonds of +3,000 carats, such as the Cullinan diamond). the number of electrical motors from 589 to only 84. In efficiency terms, these changes will give effect to improvements of 12% in electricity consumption (as expressed in kWh/t) and a staggering 65% in water consumption (0.17 m3/t to 0.06 m3/t). This is a good example of how Petra has applied the integrated environmental management principle of ‘Cradle to Grave’ planning for a new project as it has embedded environmental efficiency into the process. The optimisation of the plant was ongoing in FY 2018, with the recovered ROM grade improving from ca. 33 cpht achieved in H1 FY 2018 to 37.8 cpht for H2 FY 2018, with Q4 FY 2018 yielding a grade of 39.3 cpht, in line with revised guidance of 37 – 42 cpht for H2. A total of 0.4 Mt of tailings were treated with an average grade of 6.5 cpht. To arrange a tour of the famous Cullinan mine and learn more about its rich history and heritage, use this link.